Our Paris Passages Tour is truly a unique and interesting walk. 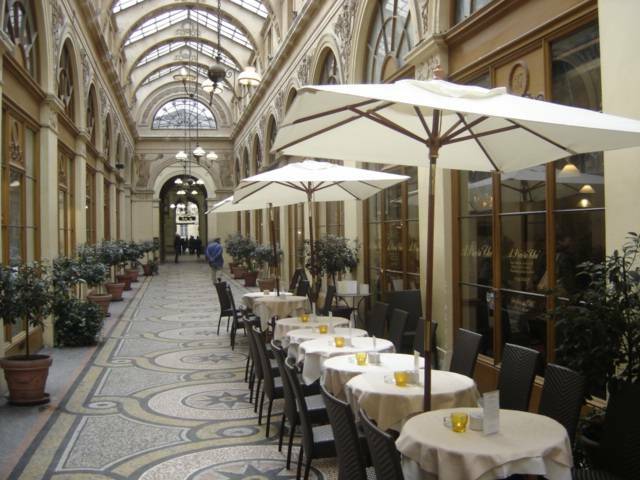 As early as 1795 these covered passages became very popular and over the next 50 years nearly 25 of these covered walking, dining and shopping areas sprang up on the Right Bank of Paris, stretching from the Louvre to the Grand Boulevards. Originally filled with cafes, shops and glass and tiled promenades, these state of the art arcades showcased 19th century wonders such as the panoramic views created by Robert Fulton, American inventor. Though many of these glass covered walks have disappear, many remain. Some have been totally renovated such as Passage Vivienne and Passage Colbert. Some have been transformed into charcteristically ethnic dining areas such as the Passage Brady, a great place to get Indian food and cooking supplies. This walk takes us from the Louvre to the Grand Boulevards, to the ancient Roman tracks to Montmartre, to the Triumphal Arch of St Denis, precursor and model for the Arc de Triomphe. If you are looking for a different glimpse of Paris then this is a tour to take. Come with us on this truly wonderful walk. Just fill out the form below and we will get back to you.